After some six months of leaks and previews, the long-awaited World Energy Outlook report from the International Energy Agency (IEA) is finally out. And in many ways, it is the bombshell we expected. The agency struck a new tone of urgency in the report, as it sharply reduced its outlook for the growth of world oil production. The world’s energy system is at a crossroads. Current global trends in energy supply and consumption are patently unsustainable – environmentally, economically, socially. But that can – and must – be altered; there’s still time to change the road we’re on. It is not an exaggeration to claim that the future of human prosperity depends on how successfully we tackle the two central energy challenges facing us today: securing the supply of reliable and affordable energy; and effecting a rapid transformation to a low-carbon, efficient and environmentally benign system of energy supply. What is needed is nothing short of an energy revolution. For the first time, the IEA included in its analysis a study of the depletion rates of the world’s top 800 oil fields. Why they didn’t include that crucial information in the past we don’t know, but as readers of these pages are well aware, it’s the hole in the bucket that is the very heart of the peak oil study. The rates they found were high enough to surprise even me: 6.7% for past-peak fields, increasing to 8.6% by 2030 (the end date of the report’s “reference scenario”). Averaged across all fields, the rate is 5.1%, but that includes 3.4% for the very largest fields, 6.5% for the next-largest and 10.4% for the next size down. This is important, because the fields being discovered today are all in the smaller categories. 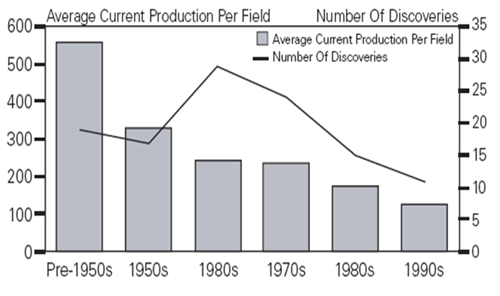 As the world’s largest and most productive fields, which are also its oldest, go past their peaks and into decline, the smaller newer fields with the higher depletion rates play a more dominant role. But these are only the “observed decline rates.” The authors distinguish that from a “natural decline rate,” which “strips out the effects of ongoing and periodic investment” (whatever that means; as far as I am aware, all oil fields require some sort of ongoing investment). The authors note that the natural decline rates “are about a third higher on average than observed decline rates,” with a current global average of about 9%, increasing to 10.5% by 2030. Against such high decline rates-up from a generally accepted 4.5% estimate only a year ago-the agency calculates that the world will need to add a whopping 64 million barrels per day (mbpd) of new capacity between 2007 and 2030 in order to meet an anticipated demand growing at 1.6% per year. That’s like adding six new Saudi Arabias (up from five less than two years ago, when I wrote Profit from the Peak). That’s like adding a new Kuwait every single year. The report goes on to say if the world does not add 30 mbpd of new capacity by 2015—equivalent to three new Saudi Arabias—it “will cause an oil-supply crunch” by 2030. More incredibly, that 30 mbpd must include 7 mbpd of new capacity above and beyond all currently planned projects! That’s over 1 mbpd of new, unplanned, unfunded capacity, plus a presumed 5 mbpd of planned new capacity (which seems highly doubtful) every year for the next 6 years. Where Do You Find Six New Saudi Arabias? One might reasonably ask then, just where exactly do they think all that new oil is going to come from, since global oil discovery has been in continuous decline for over 40 years? Although global oil production in total is not expected to peak before 2030, production of conventional oil – crude oil, natural gas liquids (NGLs) and enhanced oil recovery (EOR) – is projected to level off towards the end of the projection period. Conventional crude oil production alone increases only modestly over 2007-2030 – by 5 mb/d – as almost all the additional capacity from new oilfields is offset by declines in output at existing fields. The bulk of the net increase in total oil production comes from NGLs (driven by the relatively rapid expansion in gas supply) and from non-conventional resources and technologies, including Canadian oil sands. Out of morbid curiosity, I dug up a few older World Energy Outlook reports from the IEA for comparison. Their 2006 report had oil production increasing to 116 mbpd by 2030, needing only $4.3 trillion in investment to achieve. 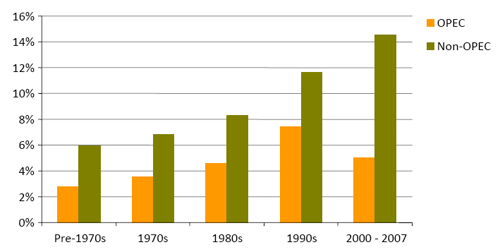 And their 2004 report didn’t see any peak before 2030, and needed only $3 trillion to achieve 121 mbpd by 2030. See a pattern here? They’re slowly backing into the truth. Here’s my prediction: their 2010 report will state that the new peak is only 95 mbpd, at a cost of over $30 trillion. And by 2012, they’ll admit that the peak was in fact in June of this year, at 87 mbpd. 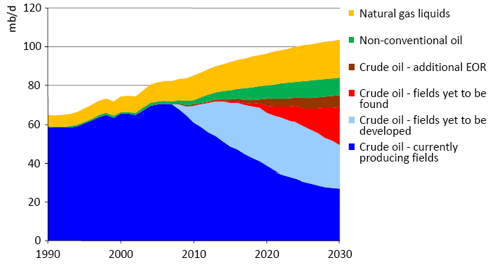 By 2030, fully 20 years past the peak, world oil production will likely be under 70 mbpd. Several new admissions caught my eye. For one, they finally seem to have put their hopes for a resurgence in non-OPEC production to rest, saying it is “at plateau and is projected to start to decline by around the middle of the next decade.” This was a bit of a vindication for me, as I had struggled with the lower-quality data I could get nearly three years ago when researching Profit from the Peak, and concluded that all future production would have to come from OPEC, despite what the official projections said. Another pleasant surprise was this statement: “The super-majors have been struggling to replace their proven reserves and expand production, while the share of their cash earnings that is returned to shareholders has been growing.” Back when I was writing Profit from the Peak I suspected as much, but wasn’t able to round up the data to completely prove it, and besides, my Wall Street buddies thought I was being too “conspiratorial” about that point. Boo-yah, boys! I also have to applaud their sharp criticism of the way that the corrupt governments of the African oil-producing nations do not share their oil revenue wealth with their desperately impoverished peoples. This is an issue I wrote about in the book that is hardly ever mentioned in the energy press, but which remains a serious threat to future oil production. So long as the criminal inequity of the status quo maintains, Africa will never be stable enough that we can count upon her to help produce the world’s precious few remaining barrels. In order to accomplish all this, the IEA projects that the world will need to spend $26 trillion by 2030, or over $1 trillion per year. Of that, over $13 trillion “goes simply to maintain the current level of supply capacity” because so much of the world’s energy infrastructure will need to be replaced by then. As Matthew Simmons has often noted, most of the existing worldwide oil industry infrastructure is literally rusting away. Ultimately, this report chooses to lay the question of future oil production at the feet of investors. If that $1-trillion-plus a year materializes, the IEA believes the energy can be had. If not, it won’t be the fault of geology or technology that oil production doesn’t meet our projected demand. And their projected increases will have to come from essentially unproven sources. So much for their scenario. Our question is: Can it be done? Or perhaps more accurately, will it be done? Most of the new oil and gas production would have to come from OPEC, since non-OPEC is “at plateau.” [That phrasing is so pretentious that from now on, I shall refer to the oil peak as a plateau with an aristocratic French accent.] Yet only Saudi Arabia has any real hope of significantly increasing its supply. It has recently produced around 10 mbpd, it has a stated capacity of about 12 mbpd, and some anticipate (while others doubt) that it will eventually reach 15 mbpd. But that’s really about it for any OPEC production growth. The Saudi king has also stated more than once that he’s more interested in long-term stewardship of the resource than in short-term maximization of profits. So let’s be generous and give all of OPEC a net production increase of 5 mbpd over current levels. IEA anticipates a massive new wave of production from the Canadian tar sands. Yet Suncor and other major tar sands producers have recently announced that they are scaling back their production plans due to the low price of oil, the uncertain global growth outlook, and problems in arranging credit for the massive capital needed to expand these projects amid a global credit market lockup. From a current level of about 1.5 mbpd production from the tar sands, I believe the research that points to a possible 3.5 mbpd a plateau by 2030. But the absolute peak of 5 mbpd looks increasingly doubtful, due to the availability and cost limitations on water and natural gas. So I’d allow no more than another 2 mbpd for the tar sands by 2030. Third, the reliance on enhanced oil recovery (EOR) will prove, I think, to be a false hope. The decades-long history of EOR suggests that perhaps it doesn’t increase total recovery at all, it just produces some of the remaining oil faster; or in the best case, it thickens and lengthens the tail of production somewhat. The implication in the report that the global recovery rate might be raised from the current roughly 30% to some 40% seems highly unlikely to me based on the historical evidence. The report still claims that reserves are growing in a significant way (which is wishful thinking) and that current proven reserves of oil and NGLs of around 1.2-1.3 trillion barrels “is enough to supply the world with oil for over 40 years at current rates of consumption.”This is truly one of the low points of the report, since the authors surely know that oil production doesn’t go a plateau for decades, then suddenly hit a wall and go to zero. After the peak, it declines, gradually, on the back of a bell curve. By avoiding any clear statement on the global peak, and pinning such enormous hopes on such slim straws as EOR and undiscovered fields, the report avoids having to deal with such unpleasant details.The fact is that 20 years from now, we’ll likely be down to three-quarters of today’s energy budge, and 40 years from now, we’ll be down to less than half. That’s the fact that any honest assessment of our situation would emphasize, not some misleading statistic about 40 years’ worth of oil. It’s more like 100 years’ worth, at production rates that decline relentlessly, starting right about now. The report claims that ultimately recoverable conventional oil resources will prove to be 3.5 trillion barrels. Again, this seems extremely unlikely, as it is based on a significant amount of oil yet to be found, and highly questionable reserves growth. I believe 2.3 trillion barrels is closer to the right number here, with 1.1 already produced and 1.2 still to go. Similarly, the report anticipates a production of 1-2 trillion barrels from tar sands and extra-heavy oil (the stuff that Venezuela has in abundance), plus oil shales (which I believe will never prove to be economical), for a total of some 6.5 trillion barrels. Then they add in another 2.5 trillion barrels for coal-to-liquids and gas-to-liquids, for a total of 9 trillion barrels in unconventional what-have-yous. This conjecture would require another entire article to debunk, so I won’t get into it now (it’s all in my book anyway), but suffice to say that I would be very surprised to see this lot, put together, add more than half a trillion barrels to the recoverable total. Prices are likely to remain highly volatile, especially in the next year or two. A worsening of the current financial crisis would most likely depress economic activity and, therefore, oil demand, exerting downward pressure on prices. Beyond 2015, we assume that rising marginal costs of supply exert upward pressure on prices through to the end of the projection period. The report also placed a heavy emphasis on controlling carbon emissions, and was unequivocal about the importance of merging the energy and climate change challenges into a unified effort—something I have advocated for years. I have no doubt that carbon emissions will soon come with a global price, and that those who are well positioned to profit from it, be they carbon credit marketers or wind power generators, will see a booming future. In addition to the $26 trillion investment in energy infrastructure, the report suggests another $9.2 trillion will need to be invested in carbon control in order to meet a goal of 450 parts per million of CO2 equivalent in the atmosphere. So that’s our global challenge: to invest another $35 trillion in energy and carbon emissions over the next 20 years. That means an unprecedented market opportunity for clean energy technologies like wind, solar, geothermal, biomass and marine energy. It means that we literally must throw money hand-over-fist at renewable energy and an electrically powered infrastructure. In sum, I don’t find their scenario terribly credible. Adding another 64 mbpd of oil production capacity from the existing, very well explored, and very well exploited resource base-a 74% increase over current levels-seems quite impossible even under the best of circumstances, let alone attempting it even as the largest fields are going into decline. Which means that the real outlook for oil production and its cost is likely much worse than even this dire-sounding warning from the IEA suggests. And the outlook for renewable energy is even greater. While the report certainly has its flaws, on the whole I think it’s a big move in the right direction for the IEA. It’s heartening to see them stepping up and addressing the twin devils of climate change and peak oil more directly, and I hope that the world is paying attention to its unflinching warning. For all the uncertainties highlighted in this report, we can be certain that the energy world will look a lot different in 2030 than it does today. The world energy system will be transformed, but not necessarily in the way we would like to see…[W]hile market imbalances could temporarily cause prices to fall back, it is becoming increasingly apparent that the era of cheap oil is over…It is within the power of all governments, of producing and consuming countries alike, acting alone or together, to steer the world towards a cleaner, cleverer and more competitive energy system. Time is running out and the time to act is now. If you wondered why they emphasized this phrase and wondered how we might climb their stairway to heaven, you weren’t the only one.